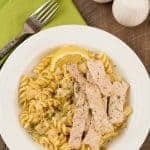 This simple pasta bowl combines tender, boneless pork with sautéed cabbage, garlic, lemon and fresh dill to make a light and easy one-dish meal. Trim any excess fat from the pork chops, slice them against the grain into thin strips and transfer to a bowl. Drizzle with the olive oil, season lightly with salt and pepper and add about 1/2 teaspoon of the minced garlic. Combine thoroughly and set aside. Melt the butter in a large frying pan over medium heat. Add the onion and sauté until softened, 3 to 4 minutes. Stir in the remaining garlic, then add the cabbage and continue cooking, stirring often, until the mixture is lightly caramelized, 8 to 10 minutes. Stir in the cream, cook for 1 minute longer. While the cabbage sautés, cook and drain the pasta according to the package directions and return it to the pan. Add the cabbage mixture along with the lemon juice, lemon zest and dill. If desired, reserve a bit of the dill for garnish. Combine well and season to taste with salt and pepper. Wipe out the frying pan and put it back on the stove over medium-high heat. Add the pork and cook, stirring constantly, until no longer pink, 3 to 4 minutes. To serve, divide the pasta mixture between 4 shallow serving bowls, top with pork and garnish with a sprinkling of dill and a lemon wedge.